Good News! 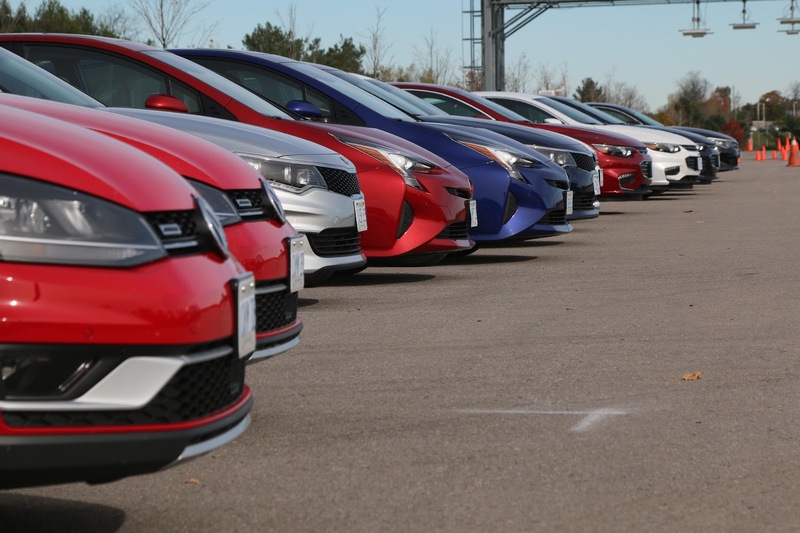 I've recently begun supplying content to AutoTrader, and my article covering the Best New Large Car category at AJAC's 2017 Canadian Car of the Year is the first piece I've provided. You can find it here. Although it's automotive content that I'm providing, it's not reviews at the moment. There's a lot of skilled people already doing that, and many of those folks don't have a second, full-time job that limits their schedule, and hence access to cars and opportunities to drive and photograph them. It'd be pretty difficult to compete for the limited number of new and available press vehicles with that crowd. Also, with no disrespect to AutoTrader or anyone else, online doesn't pay as well as the Star did, so traveling to attend events is not currently practical either. What was once a slight profit or break-even venture after expenses and lost wages were factored in would now be self-sponsored. No can do. While supplying material to AutoTrader is new for me, if you trace the timeline back far enough, Autotrader that was Autos was once Canadian Driver, and I did write a few pieces for them. Anyway, I'm pleased to have been asked to write for AutoTrader. Material published there is likely to get decent exposure once people discover that AutoTrader's website is for more than just buying and selling cars. To that end, depending on your interests, you may actually have seen Sponsored Content links to some of my articles in your Facebook feed. Keep an eye out! End of an Era? Well, not quite an Era. As with my vehicle reviews and coverage of new models and auto shows, the policy changes brought to the Toronto Star that eliminated freelance-supplied content also kicked the legs out from under my Star Touch-oriented DIY Garage series. Consequently, 2016 saw the last of those, too. I have no idea how it was determined which articles made the transition to the Star's online "Autos" section (not to be confused with Wheels.ca, which was already very different from the print edition of Wheels), but five did make it there in 2016 before DIY Garage was taken behind the barn and shot. Below you'll find those last five linkable articles. Be inspired! Inside of a 1999-2007 GM full-size pickup door. This work truck was super basic, but a fully loaded Cadillac Escalade would use the exact same door. You can read my Toronto Star DIY Garage article on replacing window regulators here. Most of what's mentioned in this article would apply to any in-door repair work, from speakers to door check to latches or locks. Things do get a bit funky with certain vehicles, however. 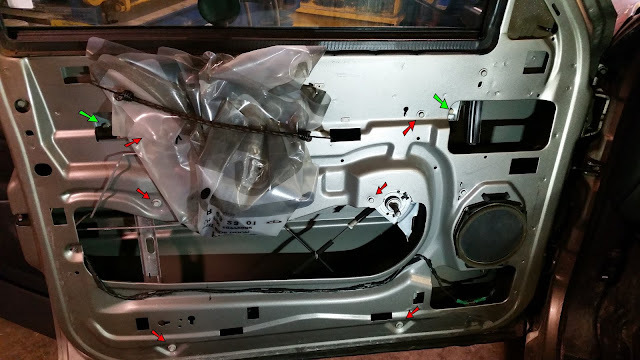 In the previous generation VW Jetta and the original Saturn S-series and the ION, the outer skin of the door is removed to service internal components. Because that made sense to somebody. At least in the Volkswagen the fasteners don't break the door skin when you try to get in there. In the Saturn S-cars, the bolts seize with rust and the crappy little steel clips that they go into pull out of the flimsy plastic door panels, destroying it in the process. Fun, wow. Another note that I didn't have space for in the Star Touch format - rather than trying to hold the glass in the closed position, it's often easiest just to remove it altogether. I prefer to stand it on edge, leaning against something in a location where it won't get knocked or fall over. Do not lay it on its side! I had a window shatter from just sitting that way on a workbench, and it did it after sitting there happily for several minutes. Tempered glass is bizarre stuff! Transmission fluid on a dipstick. Sadly, transmission dipsticks are becoming a rarity. You wouldn't believe the tools and procedures required simply to check or adjust the fluid level in many modern automatics. You can find my Toronto Star DIY Garage article on checking fluids here. Serpentine belt living up to its name - 2007 Mercedes-Benz E300. Somehow this same photo was captioned to read that it required 3 belts in the online article. Guess they couldn't count. You can find my Toronto Star DIY Garage article on serpentine belts here. The time is coming when the ubiquitous accessory belt will join distributors in the great pile of outdated auto technologies. Toyota's Prius has already done away with it, and I doubt it's the only one. 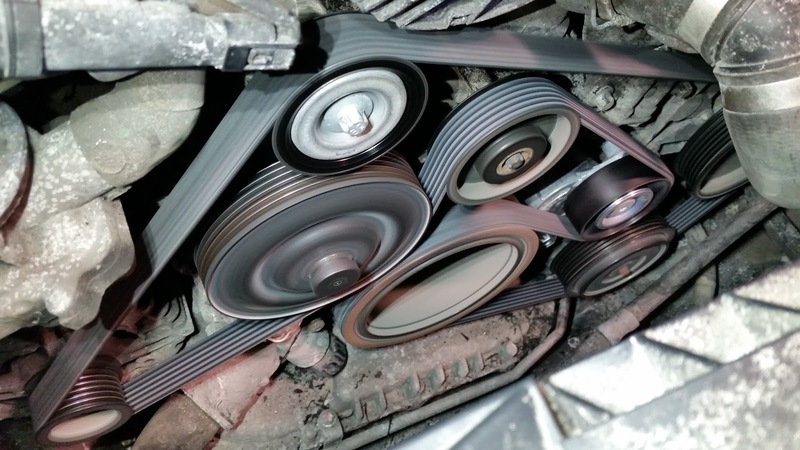 These days serpentine belts are typically only used to drive alternators and air conditioning compressors, since most power steering systems have gone electric (as have air and vacuum pumps), and many vehicles drive their water pump with their cam drive (be it a belt or chain). With the added onboard oomph of hybrids and a need for everything to remain working even with the gasoline engine shut off, a hybrid's a/c compressor is usually electrically powered, and an alternator is redundant in a vehicle with one of more large motor/generators, so a DC/DC converter handles that job. Add an auxillary electric water pump and Presto! no belt required. That still leaves the roughly 95% of new models that aren't hybrids, and they still have belts. So they may be around for a little while yet. It's not a model of a Klingon Bird of Prey - this little tab is the single biggest failure point for at least two generations of GM key fob, and it's a simple, cheap repair. 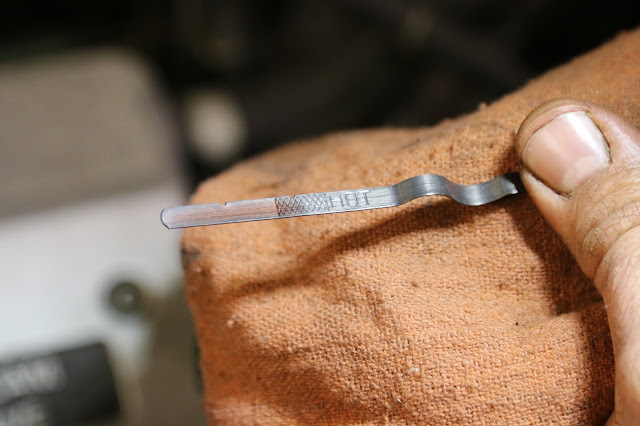 You can find my Toronto Star DIY Garage article on repairing GM key fobs here. Want to look like a hero? Have even basic DIY and soldering skills? Know somebody who owns a GM vehicle produced between the mid-nineties and roughly 2012? Ask them if their keyless fobs work properly. 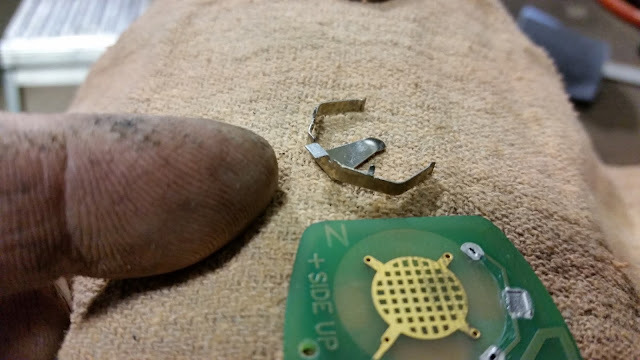 If they say "not at all" or "only some of the buttons", split that sucker open (preferably over a surface where the little steel clip shown can't easily hide), and you'll probably find at least one of the contact points for the battery retainer clip has popped off of the circuit board. Blame lead-free solder, a dumb design, and the hellish life of anything attached to a key ring. Got a wicked turbo on it... Actually, the same centrifugal action used in turbochargers is used to move coolant. Coolant is continuously pulled from the centre and flung outwards, pumping it. You can find my Toronto Star DIY Garage article on water pump replacement here. 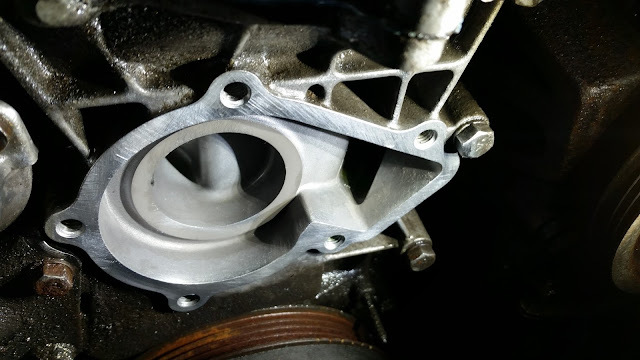 Though the replacement covered is the pump in my 1987 Nissan (which uses a still-old 1993 motor), this article remains relevant for many modern vehicles, despite the fact that quite a few run the water pump with the timing belt or chain - in itself, not a new thing. Even in those models, the process is comparable, just with the added complexity of the cam drive. This was the last of my DIY Garage series to find its way online. Maybe it was a good thing, as it was becoming difficult to find topics that were both realistic and interesting, and that wouldn't cost me a ton of money in buying parts for the sake of installing and photographing them. You can find my Toronto Star DIY Garage article on correctly setting Tire Pressures here. It is amazing just how many people don't understand that the correct pressure to set your tires at is not on the sidewall, but on the car. This goes for technicians, too. 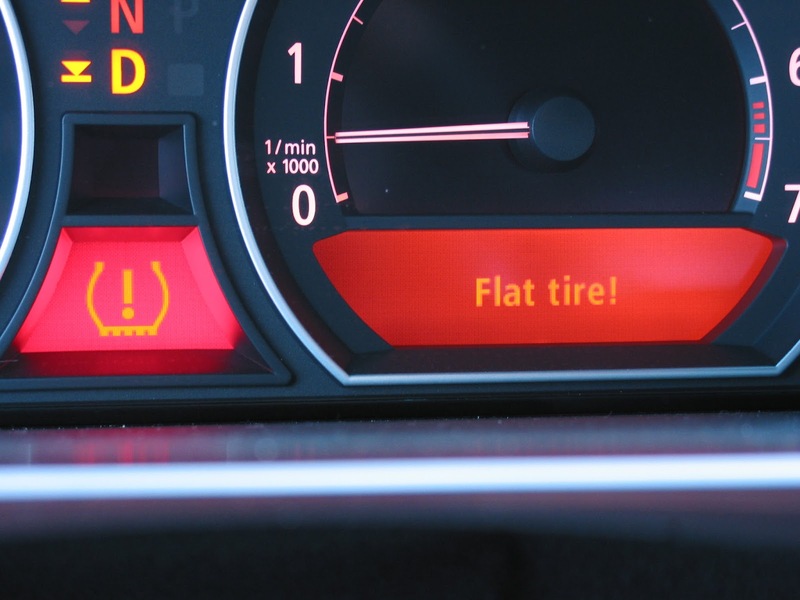 Most got into the trade years before TPMS (Tire Pressure Monitoring Systems) became common, and the techs that they apprenticed under almost certainly were never taught this. I know I wasn't. To be fair, standardized tire pressure labels didn't appear until the mid-2000's (when US law required them to be located in the driver's door jamb area). Before that point, if your car even had such a label, it could have been hidden damned near anywhere - glovebox, fuel filler door, front door or jamb, rear door jamb, inside the trunk lid, inside the centre console lid... you get the idea. In reality, the same size and load index of tire might fit several dozen very different vehicles, and the sidewall only lists the maximum working pressure for that tire, which is what determines that tire's maximum load capacity. Automakers regularly use different pressures front and rear to adjust handling and wear characteristics, even using the same size tires at both ends. Setting the pressure to the sidewall max can result in a 44psi tire on a 26 psi car; it'll get awesome fuel mileage from the lower rolling resistance, but at the cost of greatly reduced grip, far harder ride quality, and substantial wear to the centre section of the tread. 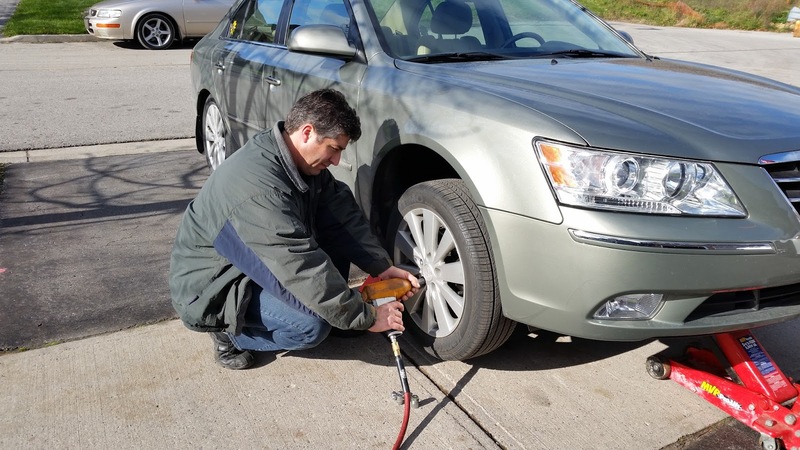 TPMS makes setting pressures accurately more important, but it's worth noting that not all TPMS systems will flag overinflation. Find your label, get a decent quality tire gauge (I like digital myself), and check your tires occasionally. They'll last longer, you'll be safer, and you may even save a little bit of fuel in the process. Yes, there's a safety stand - look just above my air gun. You can find my Toronto Star DIY Garage article on Seasonal Tire Swaps here. Not all of my DIY Garage articles made the leap from the Star Touch tablet format that they were originally published in to the Star's online content, but this is one of those that did. Seasonal tire changes are among the more basic DIY tasks, and don't require a huge investment in tools. That said, these are your wheels and tires, so if you aren't entirely confident in your ability to do it correctly, pay a professional and consider it money well spent. You don't get do-overs when a wheel falls off.